With her chaos magic, combat skills, and sorcery training from Agatha Harkness, Wanda Maximoff, A.K.A. 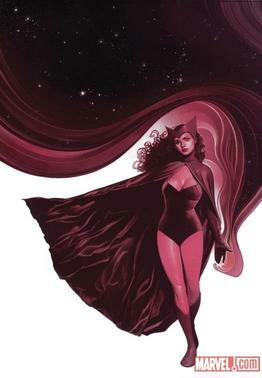 Scarlet Witch, might just be the most powerful hero in the Marvel Universe. In just one thought, she can wipe any illusory reality from existence, generate armies out of nowhere, and permanently shift the future. We also can’t forget that she’s the one to blame for M-Day, the worst day in mutant history. Don’t have reason enough to believe that she can take down anything or anyone who dare crosses her path? 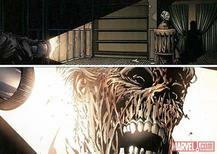 We’ve compiled a list of some of her most badass moments in Marvel history. Modred the Mystic captured Wanda Maximoff as a child and performed a ritual that would allow the Elder God, Chthon, to use her as his vessel on Earth. Just as Chthon began to purge the last of Wanda’s humanity and conscience, the Avengers stepped in and stopped him, but the incident left Wanda infused with enough chaos magic to become an omega-level reality manipulator. 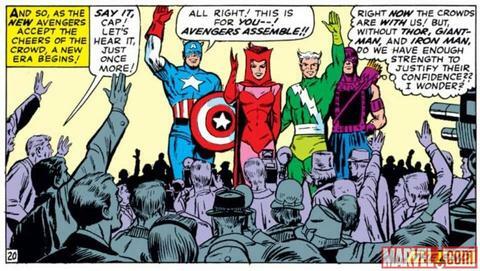 When the founding members of the Avengers took a leave of absence, Captain America created a new lineup, consisting of Scarlet Witch, Quicksilver, and Hawkeye. Though her involvement with the Avengers became a bit rocky at times, Wanda always found her way back to Earth’s Mightiest Heroes. 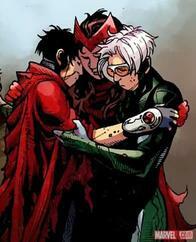 When Scarlet Witch married her Avengers teammate, Vision, she drew on magic energy to give birth to their twin sons, Tommy and Billy. Unknowingly, the magic that she used came from the demon, Mephisto, who reabsorbed the twin brothers, which ultimately ended their existence—until they resurfaced as Wiccan and Speed of the Young Avengers. When the Wasp accidentally mentioned Wanda’s lost children, she suffered a mental breakdown and lost control of her powers. This resulted in Scarlet Witch unconsciously killing off several Avengers, including Vision and Hawkeye, along with her witchcraft mentor, Agatha Harkness. She killed the world’s most powerful sorceress without even realizing it! With some persuasion from Quicksilver, Scarlet Witch created a reality where the mutants were the majority, the humans were the minority, and Magneto ruled the House of M. Later, with three words—“no more mutants”—she changed the world back to its original form, but eliminated the mutants’ X-gene, causing a mass depowering of the entire population and many casualties. 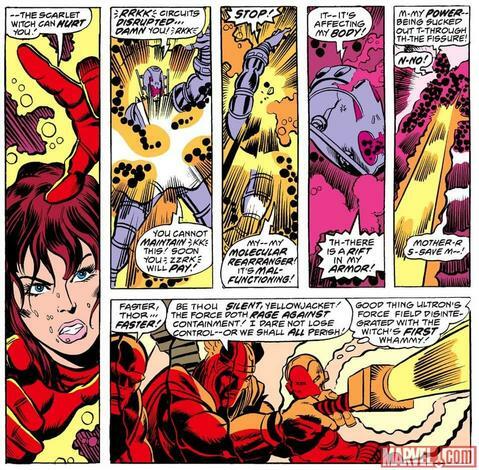 With her hex powers, Scarlet Witch has the capability to cause the robot Ultron’s circuitry to malfunction. She once achieved this by using the Evil Eye artifact to work against the inter-dimensional warlord, Dormammu, which in turn forced Ultron to short circuit. 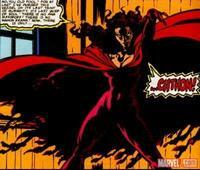 Scarlet Witch has the ability to resist the Phoenix Force and can cause pain to its hosts. 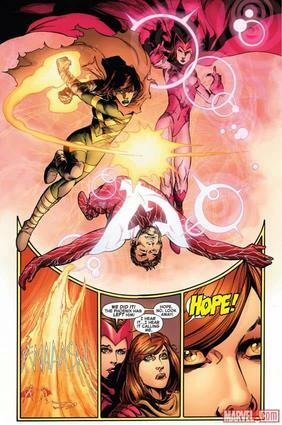 When Cyclops killed Professor X, he took on the persona of the Dark Phoenix, forcing Wanda and Hope Summers to join their powers and take him down. Much like M-Day, the two muttered three words, “no more Phoenix,” and the Force disappeared. 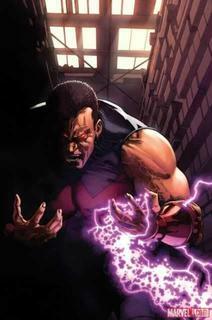 When Wonder Man joined Iron Man’s new team, Force Works, he sacrificed his life intercepting a bomb. Scarlet Witch came to his rescue and mystically resurrected him into the form of disembodied energy, bound to the Earth by his love for Wanda. 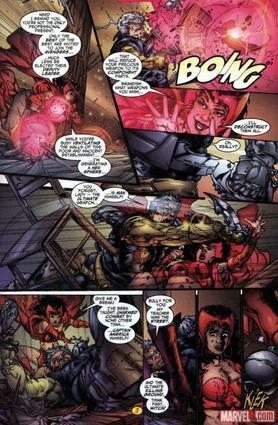 Scarlet Witch used the combat skills that she learned from Captain America and Hawkeye during her time as an Avenger, to fight and claim victory over no less than Cable. This win stands as one of her most notable in regards to her physical skills. Scarlet Witch has been identified as the nexus-being of the Marvel Universe, putting her along the same power ranks as other known nexus-beings like Merlin, Kang the Conqueror, and Sise-Neg. Her nexus-being counterpart, Lore, has the ability to drain energy from entire planets to replenish her reserves.